These reinforced graphite gaskets have a stainless steel inner eyelet that prevents exhaust blow by. The inner eyelet also increases the overall strength of the gasket and prevents high velocity erosion. The reinforced graphite has good compressibility to provide a constant seal while able to withstand high temperatures. 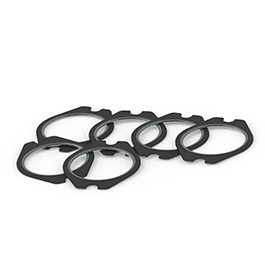 The set includes (6) exhaust manifold gaskets.